I got an exciting email just after third period today, after having turned in my first article the day before for that new blogging gig! Details to follow once things become more official, but I could not wipe the smile from my face all day! Sixth grade classes were great - I love starting my week out with them. There was really loud, shorter thunder during the morning, but during these "storms" it hasn't really gotten very windy, and the sky doesn't darken much either. Double daycare classes in the afternoon wiped me out per usual. My third grade classes went well again, I really like teaching this school year - none of the worries I had last year. My co-teacher told me that the schedule was changed that day for all other grades because June 25 is a memorial day for the Korean War. It began on June 25, 1950, which is why it's remembered today. I guess students did various activities about wanting peace/reunification with the north. In the afternoon the English room phone rang and my co-teacher answered. Then my two co-teachers talked briefly in Korean, and I heard my name said. What would it be this time, I wondered. Then one co-teacher said to me, "Let's go have watermelon." Um, okay! Watermelon is super expensive here so I never buy it myself, just eat it when it's served at lunch. We went upstairs to a teacher's room, where they'd sliced up a whole watermelon. Delicious! I had to leave about ten minutes in to go teach my new after school 1st/2nd class. I started with about ten or twelve, but by the time the 40 minutes was up there were only three students left in the room. I'm definitely going to keep bringing some paper craft for the kids to make/color each time. During my fourth grade classes they watched a short "We Are The World" clip near the end, which usually teaches some aspect of world culture. The narration is done in Korean, with a few English sentences during the story, so my ears perked up when I heard "I like Spain!" I was so shocked and unpleased with what followed that I wrote a post about it on Oh No She Madridn't, complete with screenshots for your viewing entertainment! A little girl brought us ice cream cones later in the afternoon. With my 2nd grade daycare class today I brought a few pages from magazine ads that I'd cut out of an English magazine that this apartment's previous occupant had left here. 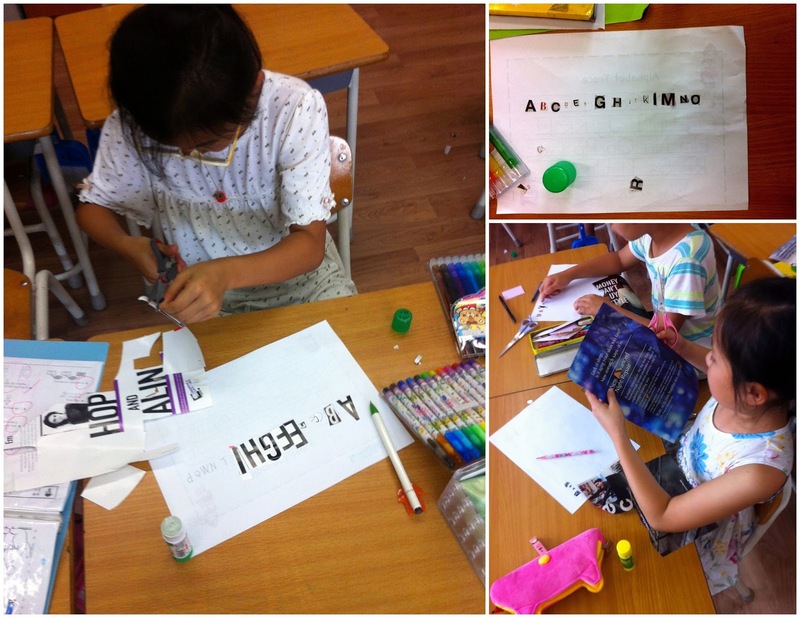 After doing an alphabet trace sheet, the kids had to identify and cut out letters, trying to do the whole alphabet. It kept them really occupied! It was great! They were all on a scavenger hunt for letters, really scouring over the magazine pages for their next letter. Fifth grade classes felt extra long today -- one of those days where you've just begun third period and think it's fourth period. It seems unreal when you finally notice that there's another whole class to teach once you finish your current class. My two daycare classes were alright in the afternoon, got two more drawings from those girls that drew pictures of me last week!